*I’ve covered a lot of funerals and been around death my whole career, but the other night provided the opportunity to make images that just blew me away. Right here close to home. Talk about being in “The Zone.” It’s the feeling that I work very hard to achieve – when the camera becomes a mere extension of the eye, and as a photographer, you are truly in the moment, witnessing something special. At times I was literally shaking, if only on the inside – or maybe it was the summer heat. After a typical long work day here in the blazing sun that started out up north covering a local college’s freshman moving-in day, quickly followed by a high school football practice, I was handed a vague assignment back in our main office that there was going to be a burial in the Village of Kiryas Joel, the Hasidic enclave here in southern Orange County, NY. There could be trouble between to the two factions of the Hasidic Satmar sect I was told. I would eventually spend two hours at the scene, and although I didn’t get to see the actual burial – the family requested that I leave. The dozens of black clad Hasidic men arriving sporting felt fedoras and gathered at the scene made for strong images in a community we rarely get to see from the inside. It could’ve just as easily been in another country. Yea, having met the face of death up close and persoanl in Haiti, Kosovo, Central & South America, and Turkey, I can now add “KJ” to this list… -cg. This entry was posted on Saturday, August 22nd, 2009 at 11:28 AM. 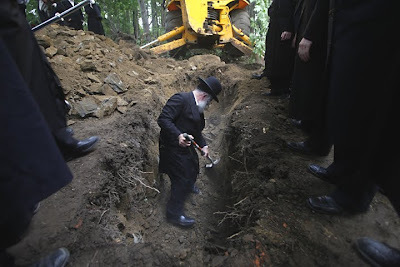 It is filed under Uncategorized and tagged with burial, cemetery, death, grave, gravesite, hasidic, jewish, kiryas joel. You can follow any responses to this entry through the RSS 2.0 feed.